Update 2018: The Restaurant at Malliouhana is now Cafe Celeste. More on Cafe Celeste. Gentle sea breezes kiss your cheek. Waves lap at the shore below. 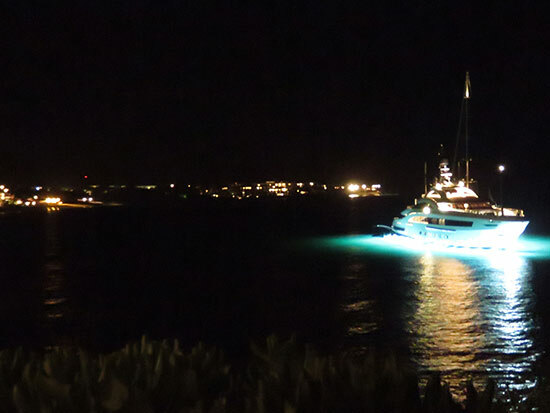 Meads Bay's lights dance in the distance. With a Caribbean guitarist playing ever so softly, the mood is set. 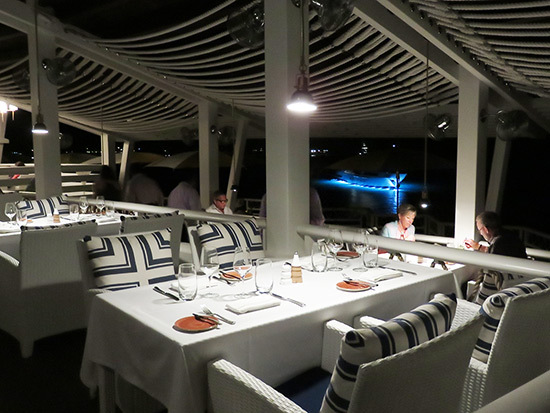 Five-star dining at its finest, this is The Restaurant at Malliouhana. Originally a Michel Rostang restaurant, it was known world-wide for its traditional French cuisine. In Malliouhana's early years (late 80s-90s), it set regional standards before its closing in 2012. Re-opened in 2014, under Auberge Resorts, it has been received with critical acclaim. Like the hotel, a timelessly elegant experience has now been restored to The Restaurant at Malliouhana. 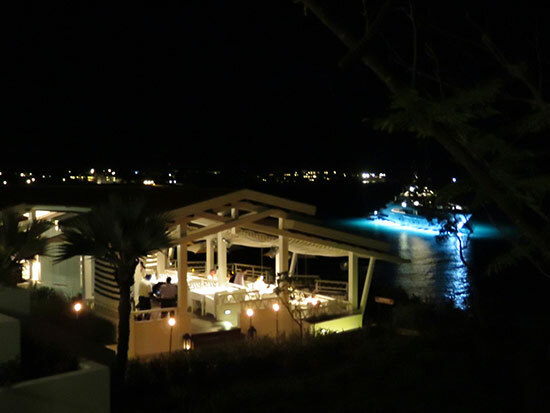 Two steps inside the restaurant's perch overlooking Meads Bay and your eyes instantly fix on the view of the bay beyond. Wood underfoot and overhead offsets the pristine, pressed linen table clothes, white tables and chairs with matching navy-striped cushions. 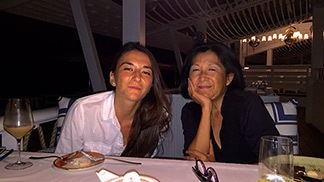 In two words, it is positively posh, yet any sense of pretentiousness dissipates once Malliouhana's staff warmly greets you. The interior winds, wrapping the cliff's edge, tiered with three dining levels, each with a view of the water. Whether with friends from out of town or for a special family occasion, each visit to Malliouhana has proven to be a most memorable meal. Take it all in, don't rush. The cocktail menu makes for a refreshing beginning to a tranquil meal. 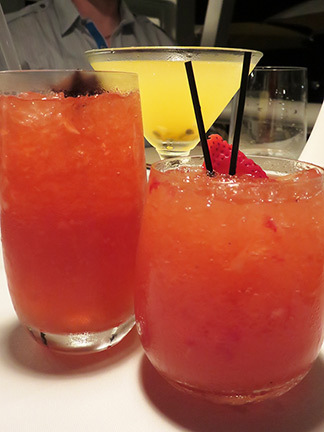 And, the selection of classic cocktails are well-varied, with a number of rum, gin and vodka-based drinks. The Caribbean Breeze and the Coconut Passion are our "go-to's". Drinks in-hand, it isn't long before fresh-made corn muffins, laced with red and green peppers are placed on the table. They are served with lime-coconut butter. The warm, artisan sourdough rolls are outstanding, too. With lightly salted butter, both are signs of good things to come. It is all thanks, of course, to Executive Chef Jeremy Bearman... a chef whose experience and background couldn't be more fitting here at The Restaurant at Malliouhana. Hailing from the Michelin-starred Rouge Tomate in New York City, Chef Jeremy has brought unprecedented levels of sophistication and modern creativity to the restaurant's menus. 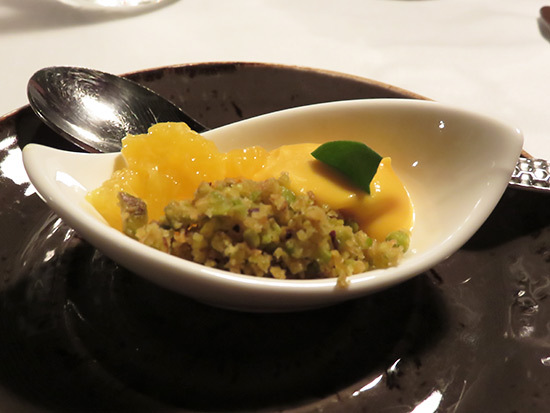 His focus on natural flavors and non-additive processes lend a health-conscious touch to the cuisine. 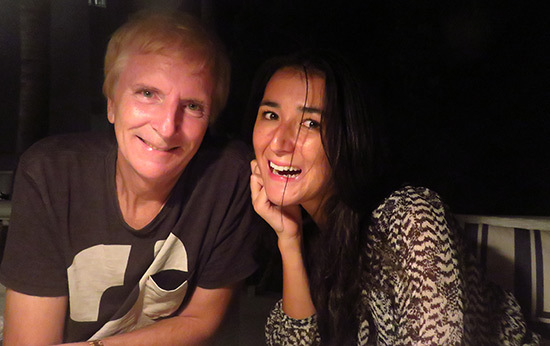 Update 2016: Since this article was written, the Restaurant at Malliouhana has introduced a NEW chef. The man that CN Traveler and Robb Report have dubbed a culinary genius, read more on the NEW menu at Malliouhana, brought to you by Executive Chef Marc Alvarez. 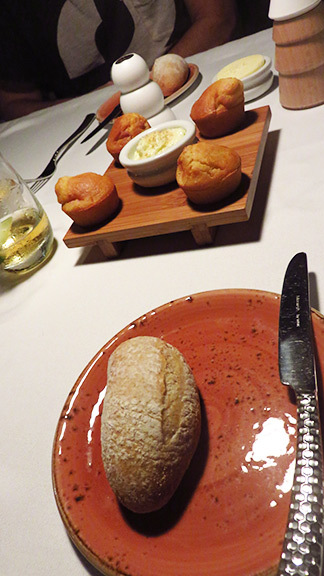 A preview of Chef Jeremy's culinary finesse is put on display with an amuse bouche that always delights. 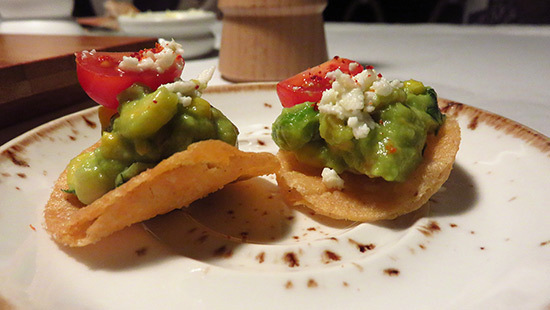 Appetizers range from gazpacho (the "ajo blanco" with almonds is one of the best), walu cevice, and a mixed salad, to that which is really out of the ordinary. True to his principles, Chef Jeremy mixes eggplant, which is in abundance here in Anguilla, with spicy mayo, pickled vegetables and tops it all with a Bryan's farm egg. Served with home-made crisps, the eggplant tartare is an interesting, vegetarian-friendly take on the classic French dish. Also on the local side of things, the pumpkin burrata salad. 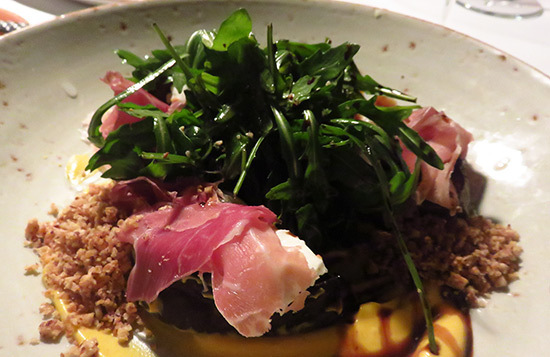 Moist burrata is layered between local pumpkin, finished off with arugula. Pumpkin permeates the dish and envelops the burrata nicely, the pancetta providing a savory counterbalance to the sweet pumpkin. Smoked, infused pork belly with vanilla and grapefruit. 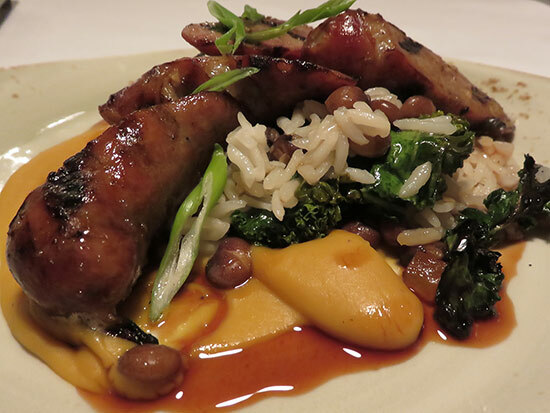 House-made goat sausage, served with Basmati rice & peas, kale and a sweet potato puree. With a spicy kick, the curry flavor in the goat sausage keeps it far from mundane. And finally, my personal favorite, the "simply" grilled octopus. It is simplicity as its best. 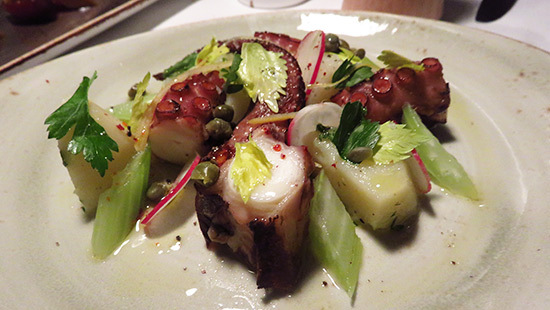 The octopus is melt-in-your-mouth heavenly, grilled with celery, capers, lemon and parsley, and accompanied by sumptuous, soft potatoes. Homemade pastas, many of which can be prepared gluten-free, and modern entrees follow the first course. Chef Jeremy's acute attention to ingredients is seen here, too. 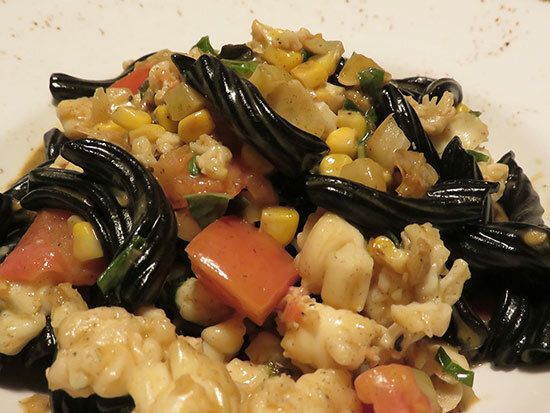 Squid-ink infused Garganelli is tossed with corn and tomato, bathed in a sea urchin butter, with large chunks of fresh spiny lobster. Ragu-based pastas, including a rabbit ragu and beef & pork (bolognese), are up next. 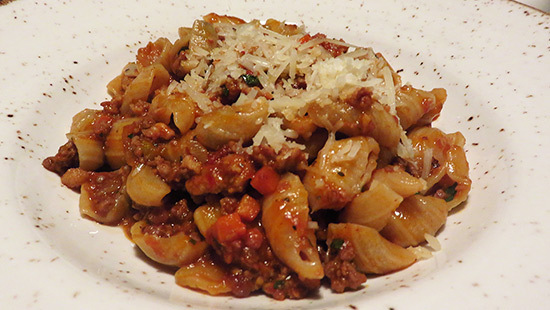 The Bolognese is Yuki's top-pick, complete with red wine, oregano and fresh Parmesan shavings, the sauce is well-suited to its pasta... an orecchiette. 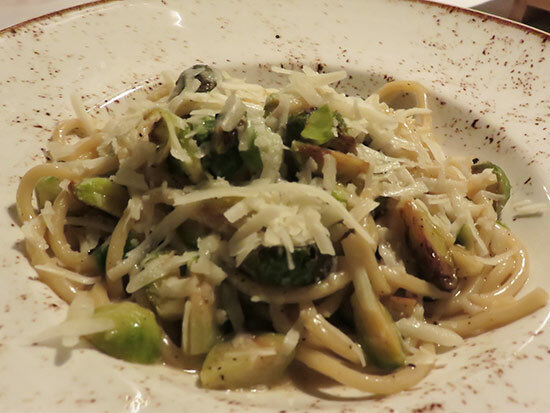 The Cacio e Pepe warms the soul, with every bite of its buttery, savory, Pecorino and brussel sprouts. 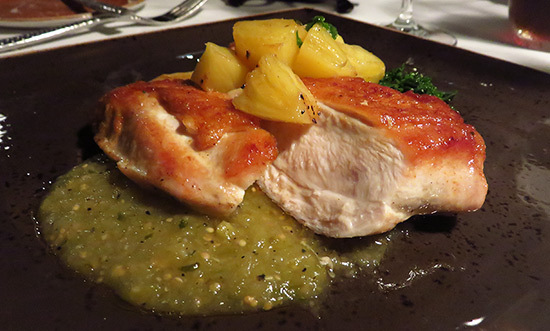 Pan roasted, organic chicken is served with plantain mashed potatoes, kale and salsa verde for a touch of something sweet. 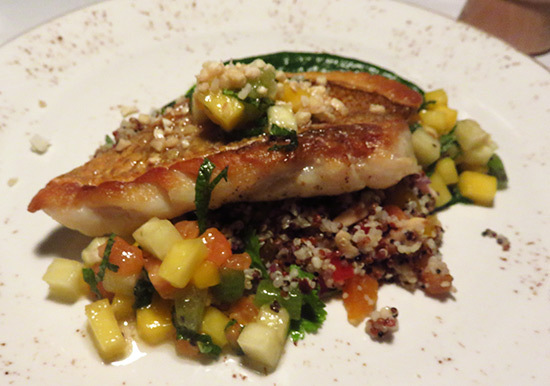 Banana-cashew crumble and a mix of tropical fruits dress up the fresh Anguillian snapper. 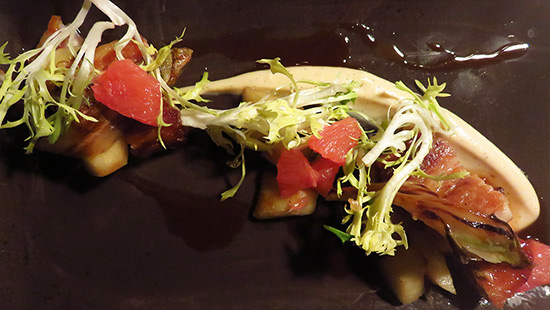 Chef Jeremy balances nutritional value and contemporary combinations with every entree. Even the Anguillian lobster throws caution to the wind. 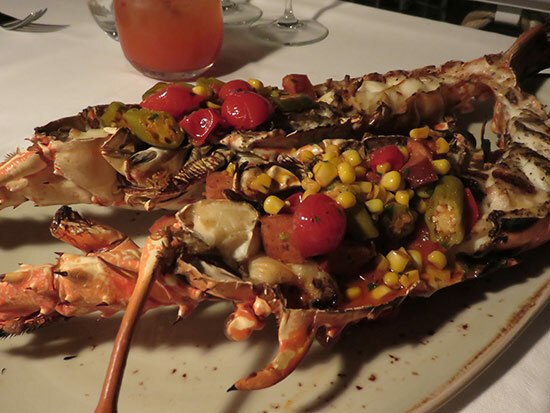 The lobster meat itself is simply grilled, its shell filled with a mix of okra, sausage and sweet corn, with buttermilk grits on the side. And then there's the tuna paillard, my entree of choice. 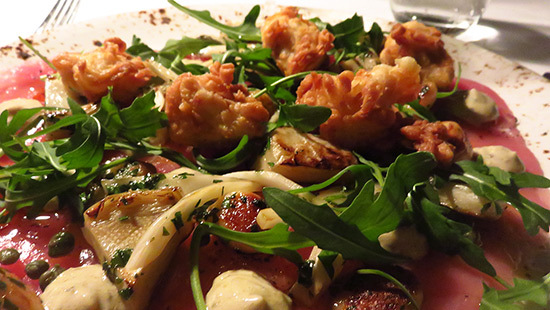 It is a twist on the classic paillard, the tuna prepared carpaccio-style. A thin layer of raw tuna lines the sizable plate, seasoned with grilled fennel, artichoke and capers. The extra-special touch? Perfectly fried sweet breads dotting the ensemble. Creative, light and indeed divine! Never quite ready to say "good night" to Malliouhana, and left wanting more by the previous courses, dessert at Malliouhana is always a must. 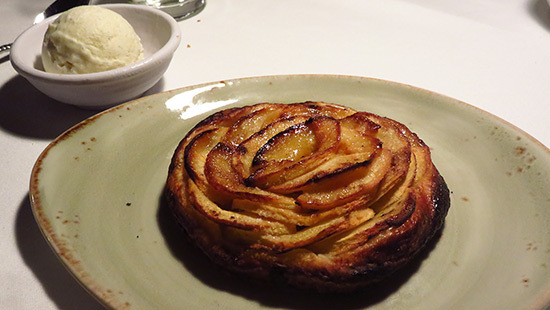 My Mom and sister will tell you that the apple tart is the best on the menu. Oven-baked, it takes an extra 15 minutes to prepare and it is worth the wait. With a scoop of vanilla ice cream made in-house, it is picture-perfect. Maybe it is the kid in us, but my Dad and I order dessert off of the lunch menu. 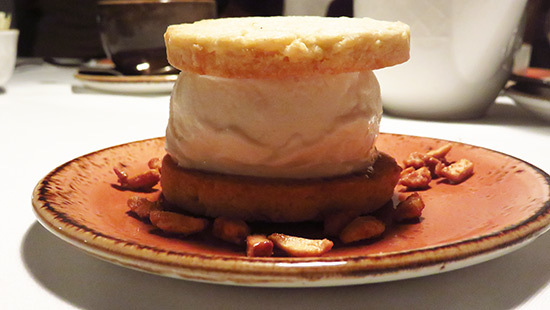 Gourmet ice cream sandwiches, with a number of cookie types and ice cream fillings, rule day-time sweet eats. You can, though, order them for dinner. A brownie cookie with salted caramel ice cream for my Dad and the Mexican wedding cookie with Horchata ice cream, rich in almond, for me. And then, just like that, a blissfully sweet meal comes to an end all too seemingly soon. 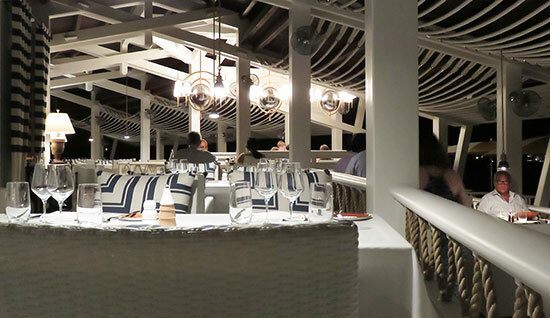 One of the most serene, seaside dining settings on the island, The Restaurant at Malliouhana has returned to set a new level of culinary sophistication. Hours: Daily and nightly for breakfast and dinner. Lunch is served at The Sunset Bar.